These are the four guiding principles that FSTC has rallied around from the start. The enormous potential of Forest School - but more importantly, the huge responsibility - of working with a group of children, young people or adults over an extended period of time is too great to treat with anything other than the utmost seriousness and repect. As such, it is the learner who drives what we offer as Forest School trainers. 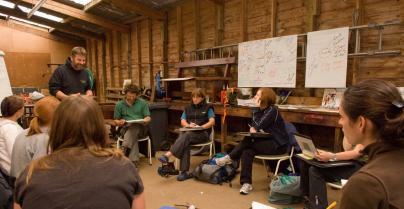 The Forest School Training Company (FSTC) was set up in 2004 by Gordon Woodall (one of the pioneers of Forest School in the UK) and Simon Shakespeare (an established Forest School leader and experienced trainer and permaculture designer) to respond to the growing demand for Forest School training throughout the UK. In 2005, Gordon decided to dedicate himself full-time to running his outdoor learning centre in Somerset and so FSTC was taken over by Simon and his wife Marijke. They strived to deliver an increasingly contemporary and relevant training package, but more importantly continue to inspire future Forest School leaders with the original ethos of true, child-centred learning in the outdoors. More recently FSTC has continued to grow and develop in exciting new directions, in a truly Forest School way! Currently the FSTC brand and assets are co-owned by lead tutors Louise Ambrose (England), Aline Hill (Scotland) and Mike Brady (Scotland). A licencing scheme is being developed to enable other trainers to trade under the FSTC banner, after undergoing tutor development. All tutors are expected to be members of the Forest School Assocaition (FSA) and enable their students to access the year's free membership as part of their training offer. We also encourage tutors to be involved in the FSA and/ or link with groups that are active at a local level. FSTC is a member of the UK Forest School Training Network (a voluntary network) and is involved in the standardisation and development of Forest School qualifications within the UK. We work closely with the national FSA (Forest School Association) and are working with others in pursuing the establishment of a nationally-recognised Quality Assurance scheme for Forest School. We also have strong links with The Forestry Commission, The Forest Education Initiative and The Institute for Outdoor Learning. Together FSTC are a group of people who feel strongly that quality processes are important and have united to work together to promote Forest School. Since setting up in 2004 we have successfully trained a huge number of Forest School students (see testimonials below), many of whom have gone on to set up and deliver innovative Forest School projects either independently or within their existing professional capacity.